Saint Peter’s Square was designed between 1656 and 1667 by GianLorenzo Bernini, who was also the final architect of St. Peter’s Basilica. The aim of the square was to provide a welcome to Roman Catholics as they came to the church and to impress non-Catholics enough so that they would consider converting. 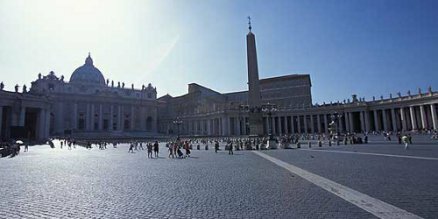 Due to the Lateran Treaty, Saint Peter’s Square is actually part of Italy and the city of Rome, not Vatican City; where the colonnade extends from Saint Peter’s Basilica there is a security check as you enter the Vatican State. The square is used most weeks during the summer on Wednesday mornings for Papal Audiences when chairs are laid out. During the winter or on bad weather days these audiences happen in the Audience Hall of Paul IV which is to the left of St. Peter’s Basilica. The Pope also addresses the faithful on Sundays at Noon from his office, a less formal event, which can be seen by simply standing in the square. Originally the square had a square portico with a pine cone fountain in the middle. This was the case from the time of Constantine’s Basilica in 326 AD right up until 1506. This pine cone fountain, taken from the Pigna district of Rome near the Pantheon, was later moved in to the Vatican Museums and currently sits in the Courtyard of the Pine Cone. The first contemporary thing in the square was the central obelisk, which is over 3000 years old, and was one of the obelisks taken from Egypt by the Emperor Gaius (or Caligula). He placed it in the middle of his chariot racing track which he built on Vatican Hill in the 40s A.D. This was to the left of the current basilica. This stadium was repaired by Nero, who had Saint Peter executed in it around 67 A.D. Nero blamed the Christians for starting the Great Fire of Rome, three years previously, which had burned almost half the city while Nero was on holiday. Peter was buried in a nearby cemetery which the basilica was later built over. When Christianity became the State Religion of Rome in the late fourth century, the obelisk was ordered preserved as it was one of the last things seen by Saint Peter before he died. It was not until 1586 that the Obelisk was moved directly in front of the church by Domenico Fontana, himself an architect of Saint Peters at the time. This in itself was a huge architectural triumph as the monolith weighs over 300 tonnes. The undeveloped square now had a centrepiece. Fontana’s Successor, Carlo Maderno, added the fountain on the right side of the square nearest the Papal Apartments. Fountains were a symbol a baptism and if needed this water is potable although I would not recommend drinking it. Maderno’s Successor, Bernini, moved this fountain in line with the obelisk and added a replica fountain on the other side. The three vertical elements in line were reminiscent of the spina, spine or halfway marker in the chariot racing track where Peter was killed. Bernini had two ideas when he planned the square. The first was the chariot racing track where peter was crucified, hence the elliptical shape, and the second was the Keys to Kingdom of Heaven he was metaphorically given by Jesus [Matthew 16: 17-19]. If you look at an aerial photograph of Saint Peter’s Square you can see a round circle (the chariot racing track) and a trapezoid connecting the square to the church; a circle on top on a square. If you look at the bottom of an old key you will see the same effect; a circle on top of a square. So the square looks like the bottom of a key and a chariot racing track at the same time. There are 248 Doric columns in the two colonnades which extend out from the church like arms embracing or hugging visitors. The columns are arranged around in to rows of four. Bernini was such a genius a symmetry he put two circular markers on the square, exactly halfway between the fountains and the obelisk, and if you stand on these foci spots and look at the columns they precisely line up. You can only see the first column in each row. Much of the travertine used in construction of the columns was recycled from Roman monuments including the Colosseum. Take the tour, even if you will do it on your own later. Dara was fantastic!! Really informative, considerate of everyone on the tour. Aware that it was a long tour with a lot of walking and was always aware of the groups comfort and needs. He was also very funny and entertaining, I would highly recommend him! A wonderful experience. Well worth the price. Excellent knowledge shown by Dara and any questions quickly answered. Would recommend strongly. Dara was a good guide and seemed to know what he was talking about, plus he was easy to understand. We had a wonderful time on our tour. Dara was knowledgeable and friendly. The Vatican trip was a highlight of our trip to Rome. Thank you. Italy Tour Dara was Fantastic! Dara was fantastic! Not only very informative but funny as well. He kept the group together well, he frequently asked if everyone was okay and we stopped for toilet breaks. The tour was so interesting and well paced. It was also great that Dara was able to talk and walk at the same time unlike the guide the following day! Our guide was fantastic, really bought everything alive! Vatican Tour The Tour was Excellent! The tour was excellent! Very informative. Dara was an excellent tour guide – funny, knowledgeable and very friendly. This was the best tour we went on during our stay in Italy.